The Independent Games Festival Finalists Have Been Announced! The finalists for the Independent Games Festival Awards have been announced. The winners will be announced during a ceremony taking place on Wednesday, March 16 at San Francisco’s Moscone Convention Center. Nathan Vella, the co-founder and president of Capybara Games, will be this year’s host. Winners will receive more than $50,000 of prizes. This will include the $30,000 Seumas McNally Grand Prize. That isn’t all though. The idea here is that the awards will shine a bright light on these games so they might see a bump in sales from curious gamers. The Game Developer’s Choice Awards will take place right after these awards conclude and both events will be available for viewing on Twitch. The indie game space is in an amazing place right now. There are literally thousands upon thousands of brilliant minds hammering away at keyboards coding new and interesting gaming experiences the likes of which we have never seen. This means it is a GREAT time to be a gamer and while the violent and gory games tend to get the press the family gaming space is just as vibrant. Runbow is the result of some of that brilliance and I could not be happier to have had a chance to play it. They do this by using the Wii U gamepad and four Wiimote and nunchuck pairs. The Wiimotes and Nunchucks are each used to create separate controller inputs so two people can essentially divide the controller in half. It’s genius! The game itself doesn’t exactly take away from that genius either. There are numerous game modes, but the core mechanic is consistent throughout. You control a character that uses jumps, double jumps, and a move very similar to the air moves in Super Smash Bros for Wii U to navigate various platforming levels. That by itself is not all that new or innovative. What IS new is that these stages are filled with various colored platforms and the background regularly changes colors. If the background changes to the color of the platform is, essentially, vanishes. If you happen to have been jumping their? You will likely be falling to your doom quickly thereafter. The result is a platforming game that is as strategic as it is fast. You really need to think on your feet because one small mistake can end in the end of your turn. The good news about all of this is that levels are fast each lasting no more than a minute at the absolute longest. The keeps people who make a mistake early from having to sit out too long. There are a host of game modes available including several single player modes that are all excellent thanks to well designed levels and tight platforming mechanics, but the real strength lies in the competitive multiplayer mode. It is even available online if you want to pit yourself against the very best. This leaves success entirely dependent on your precision platforming and your ability to parse the chaos going on around you. Runbow is a unique experience that comes at a low price point. Its strongest mode is the 9 player multiplayer so it is a must own if you regularly have that many people over to play games together. Make sure to download it on the Wii U eshop. Shovel Knight is Getting an Official amiibo! Nintendo held an event called Nindies@Night at the EMP Museum in Seattle ahead of PAX Prime. They made several high profile announcements regarding independent games being brought to the Wii U and 3DS consoles. None of the announcements made at the event were quite as big as the announcement of a Shovel Knight amiibo figure. I’m sure you’re wondering why I called that a major announcement. It makes sense to question me here. Amiibo aren’t a huge part of the actual GAMES on the Wii U or 3DS. They are mostly a collectable side project with some interesting cosmetic effects in games. It is entirely possible to skip them entirely and not suffer for it at all. BUT, even when we set that aside for a moment, this is still a pretty big deal because it shows Nintendo continuing their strong commitment to independently developed games. The Shovel Knight amiibo is also a very interesting business arrangement. Yacht Club games is responsible for manufacturing and distribution, but Nintendo has stated that it will be displayed in stores alongside the first party amiibo. (That is all assuming you’ll ever be able to find one). The figure will work with the Wii U and 3DS versions of Shovel Knight. In the 3DS version the figure will unlock special challenge stages. Those same stages will be unlocked on the Wii U version as well, but will also unlock a Wii U version exclusive coop mode. Yacht club has also promised that the amiibo will have some effect in all of their future amiibo enabled games. Pretty neat stuff if you ask me. Ask you going to be getting one? Let me know in the comments! The Humble Indie Bundle All-Stars Have Arrived! The folks over at the Humble Bundle are at it again. They have released a new, and amazing, bundle of independently developed games that is available for an absurdly low price that can be almost entirely donated to charitable causes! This time around the bundle includes the “All Stars” These are games that have appeared in bundles before and were HUGE draws. Many of them are award winning indie games that have been around for years. The fact that these games were available years ago might not be relevant to parents and families who aren’t buying games until recently. This is a greatest hits collection of independent games and among them the only games that are not really acceptable for kids are Limbo, Braid, and Super Meat Boy. With that saidthere are videos of those games available all over YouTube so parents can watch the games plays and see if they are problematic for their children. The reality is that it is almost summer time and this stack of games will help to fill up whatever screen time you allow your kids to have for a very low price. The Odd Gentlemen Announce The Voice Cast For King’s Quest! King’s Quest is set for release later in 2015 and The Odd Gentlemen, the developer in charge of the reboot, has released a video showing off the amazing cast of voice actors that they have assembled. I was excited before, but this news has me even more hyped than before. Christopher Lloyd – He has a very distinctive voice and style about him that fits in very well in a story that is intended to be dramatic while still containing comedic elements. Josh Keaton – Josh is doing the voice work for King Graham. He holds a VERY special place in my heart because he also did the voice acting for Hercules in Disney’s Hercules musical. Zelda Williams – Zelda is the daughter of the late Robin Williams, but that isn’t her only claim to fame. She has made a name for herself as a voice actor and has been in a number of games and cartoons. Wallace Shawn – It is inconceivable that you don’t know who this is. He is a talented voice actor who has been in all kinds of movies. His talents will certainly liven up the entire experience. Tom Kenny – Who doesn’t want Spongebob Squarepants himself in their video games? Loretta Devine – Doc Mcstuffins is one of the better shows for younger kids on Disney XD and Hattie the Hippo is one of the more entertaining characters. Loretta is a talented voice actor with a lot of range and the ability to deliver humor and heart in the same scene. She’ll be great. 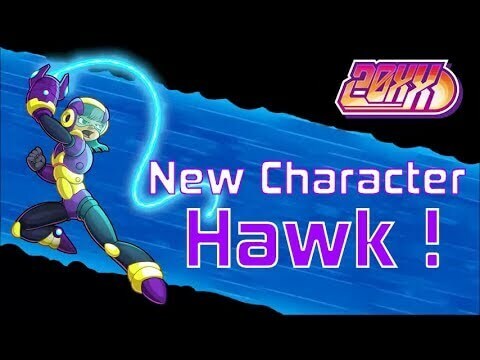 New Characters to Guest Star in Runbow! Runbow was one of our favorite games at PAX East 2015 because it allowed us to do something that we had never done before: play a nine-player competitive multiplayer game. You can read our preview here. 13am games is planning to release the game later this year, and while they are still tuning the core gameplay and adding new modes they did have a new announcement for people looking forward to the game. Runbow is looking better every day. We can’t wait to get our hands on it. Keep your eyes on Engaged Family Gaming for a review once the game is released! Pax East 2015 Preview – VIKING SQUAD!!! Brawlers are a great genre for families. They give more skilled parties (be they parents or children) the chance to help the less skilled players enjoy the game experience together. 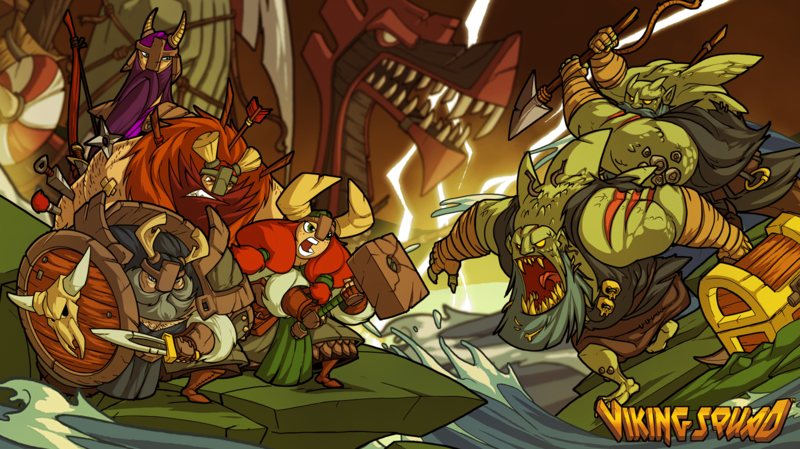 Castle Crashers has been a fan favorite for years, but Viking Squad looks like it has the chops to help carry the torch even longer. Viking Squad, by Slick Entertainment, is a three player cooperative brawler that is themed around viking warriors who are trying to wage war on supernatural horrors. There are four different playable characters: a grey-haired character who fights with a sword and shield, a berserker who duel wields battle-axes, a warrior maiden who fights with a massive hammer, and a lithe male archer who looks to offer a change of pace to the other three bruisers. I am sure that a lot of parents hear about battle axes and viking warriors and are imaging a gritty game with a lot of blood. Fear not! I spoke to the developers and was told that the current build includes a toggle to turn blood off. They are even considering dropping the blood entirely in an attempt to draw in a wider audience. This is a great sign for dads (or moms!) who want to rough up some bad guys with vikings! I spoke to the lead artist at PAX East and he let me know exactly what we can expect. He called Viking Squad “A big dumb name for a big dumb game.” This will sound bad to a lot of different folks, but I love it. Sometimes you just want to hit some buttons and make things happen. This looks like it will be a great experience. We are a huge fans of the brawler genre so you can count on a lot of coverage for this game including some developer interviews, concept art, and other great stuff as this game comes closer to release on the PS4 and PC. Keep your eyes here on Engaged Family Gaming for further coverage and a review once the game comes out!